SLOATSBURG, N.Y. – Randi Colton first learned CPR roughly 27 years ago when she was in high school. For the past 10 years she has run her own CPR training business, FitChick CPR. One of the biggest lessons she has learned over the years doesn’t have much to do with CPR. “The timing is everything,” Colton said Thursday afternoon. 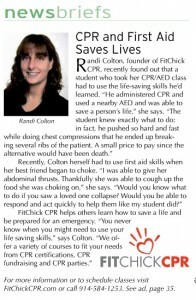 Colton is a 2016 graduate of the Leadership Rockland program and teaches CPR classes at The Valley Hospital in Ridgewood, N.J. in addition to running FitChick CPR, which offers First-Aid and CPR training courses, including a Babysitter’s Safety Course, for an array of clients. The business name comes from a few nicknames from Colton’s past: growing up, she was labeled “penguin chick” by her friends due to her affinity for the flightless birds; next, she was dubbed “fit chick” by her husband after she began taking fitness classes at Lucille Roberts to meet people after moving to Rockland County. That name stuck and Colton use it for her personal training, health and nutrition coaching venture, FitChick Fitness, before she found her CPR niche. In the past 28 days, Colton has taught 21 CPR classes for a mixture of clients. It’s impossible to predict when these life-saving skills will be needed but important to be prepared for when that time comes. “Everyone should know life-saving skills but a lot of people are afraid to learn. And that is one of my biggest obstacles because people don’t want that responsibility,” to be tasked with saving someone’s life, Colton said. 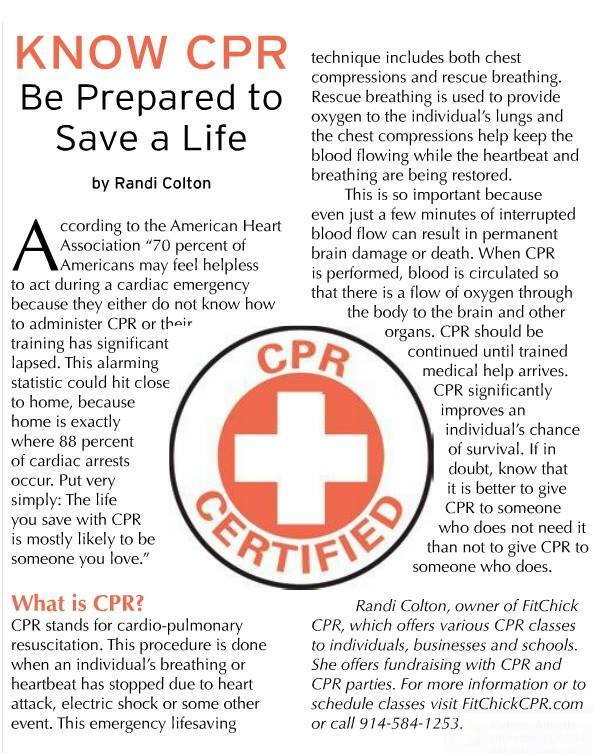 She added that people often panic in such high-pressure situations and forget what they learned, which is why receiving CPR training once every two years to be certified isn’t enough. For Colton the first time she administered CPR to someone suffering from cardiac arrest came only a few months ago. During a visit to the county Office for the Aging in Pomona with her Leadership Rockland group, Colton performed CPR for eight minutes and administered three shocks with an automated external defibrillator (AED) to an employee , who went into cardiac arrest and collapsed in his office, before paramedics arrived, she recounted. The man was transported to Good Samaritan Hospital but was taken off life support by his family two days later. If it wasn’t for Colton, the family would have received a different type of phone call. “Well, now I can’t say that. Now I say, ‘I’m going to teach you life-saving skills that you may need to use one day. It happened to me,'” Colton said. “If you needed to save a loved one’s life in an emergency situation, would you be up for the challenge?” asks Randi Colton, owner of FitChick Fitness. “We offer various CPR classes that fit your needs either at your home, business or school in the Rockland and Bergen County areas.” From Fundraising with CPR to CPR Parties and other CPR courses, Colton offers a wide variety of ways to learn CPR. In addition, Colton offers a CPR Babysitting class open to 11 to 14 year olds who want to learn how to babysit safely. The course covers being home alone, preparing for babysitting, growth and development of children, and activities to entertain children of varying age levels. It also covers recognizing emergencies, calling 911, as well as adult, child and infant CPR and choking. 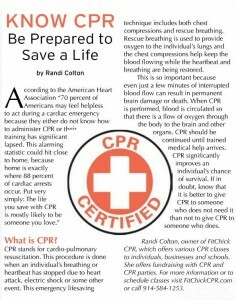 Class participants will receive American Heart Association “Friends & Family CPR Training”. Colton is also a certified Health Coach and Personal Trainer Instructor. For more information and upcoming training dates, call 914-584-1253, email randi@fitchickfitness.com or visit FitChickFitness.com. Randi Colton knows plenty about health and nutrition – things such as how to hydrate the right way and how to eat to feel healthy and happy. Colton also knows how to save lives through CPR. Colton is a certified Health Coach and Personal Trainer Instructor who is also an American Heart Association CPR/First Aid Instructor from Valley Hospital — the Sloatsburg resident also recently added fundraising to her growing portfolio. Colton held CPR fundraising class for women at the Sloatsburg Ambulance Corps in mid-August that helped raise funds for Doug Corbett, a Fitness Nutrition Coach at Rockland Peak Performance (RPP) who was just diagnosed with cancer in June. Nunzio Signore, owner of RPP, has planned a full-out fundraiser for Corbett at Rhodes North Tavern on Sunday, September 7 (look for more on this event at SVdotcom). 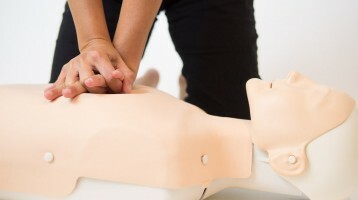 The CPR courses Colton offers range from a simple Lunch & Learn course that teaches people what to do in an emergency situation to full CPR participation and completion courses that can last anywhere from two to six hours. fitchickfitnesslogo“I am teaching a CPR/Baby Sitting course at the Sloatsburg Library in November,” Colton said about her on-going effort offer a portfolio of health and fitness instruction. “The November class takes place on the 1st and 8th,” said Colton about the Fall 2-day course which will certify participants.